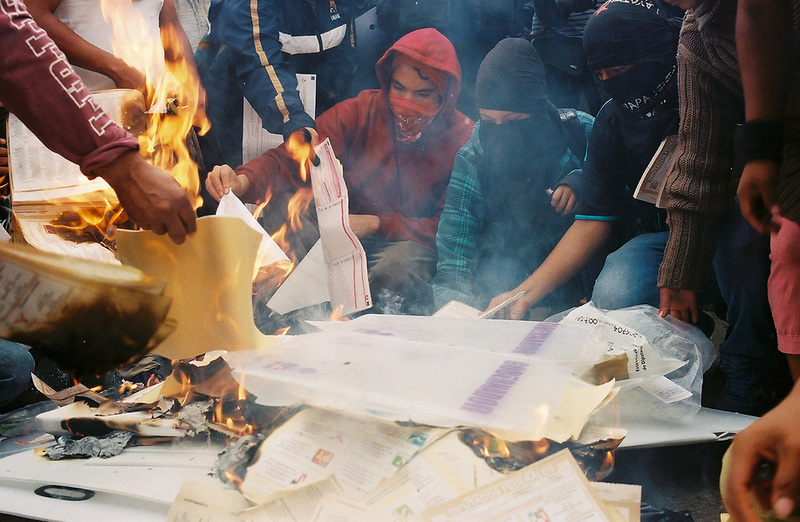 Protesters burning voting materials during a boycott of the state elections in Tixtla, Guerrero, Mexico. The year before, 43 students from a college in this town were kidnapped and disappeared by police, and they still hadn’t been found. It’s painful. It reminds me of the torment of the missing students’ friends and families, who still have no answers. And a feeling of lost hope — the case caused such huge protests against corruption and the Drug War that change seemed possible, but the violence has only gotten worse. 2017 was Mexico’s deadliest year on record. I remember kneeling in front of the fire to make this picture. It looks just the way I imagined it, but I'd given up on ever seeing it. At the time I was doing a project on the missing students, and when I developed the film, all the rolls were accounted for but this one. I looked for it everywhere and thought it had been lost. The tense days before the elections, rumors circulating that the army was going to repress the protests. In the end a young man was shot in a nearby town. His funeral is burned in my memory. But this picture is personal for me now in a way I didn’t expect. My future husband, a Mexican photographer, is just outside the frame. This was where we first met. Months later we became friends, and a year after this was taken he flew to New York to tell me how he felt. I think some people will be drawn to the image because you can sense the unrest behind it. For those who have some connection to or knowledge of Mexico, it might stir up deeper emotions about the trauma its people are facing.